It’s been said that there are two kinds of people – those who love mountains and those who prefer water. This new tour is for both. 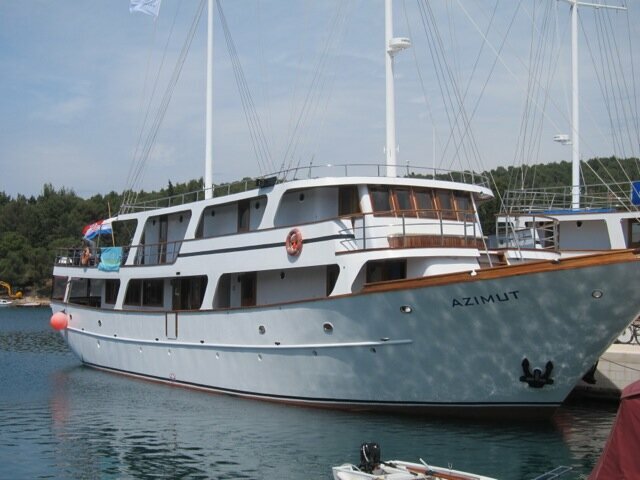 If you love the ocean, then you’ll surely love this voyage in the sparkling Adriatic Sea through the Dalmatian Islands off the coast of Croatia. If you live for mountains, then you’ll certainly enjoy the beautiful views and the cycling. However, if you like flat rides, then rent an e-bike and feel all the hills disappear! Hilly terrain with some longer climbs. Moderate to advanced cycling level. Leisurely cycling level with an E-bike. 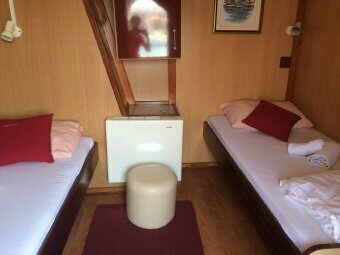 7 nights lodging on a motorized boat, 7 breakfasts, 7 lunches, 6 dinners, maps, two guided walking tours, unlimited drinking water, port fees, rental hybrid bicycle, and trained bilingual guides. Hybrid bicycle is included in the tour price. Electric-assist bicycles are also available for an additional $295. E-bikes add power to your pedaling, flattening out the hills and increasing your speed. They make it easier to do all the miles in all types of terrain. The Azimut, has 18 cabins each with its own bathroom. Some of the rooms are above-deck and have a porthole and a door that opens to the outside. Other rooms are below-deck with a door that opens into a center hallway and a porthole to the outside. These rooms are quieter, darker, and tend to sway less, even though our boat generally experiences minimal rocking. Fly in and out of the Split, Croatia airport (SPU), and take a 10-minute bus or taxi to our boat in Trogir for the start of the tour. "We had so much fun & learned a lot about Croatia & its people. This trip was a god send to me. This group of women restored my faith in the kindness of womankind. What a great group of women!" 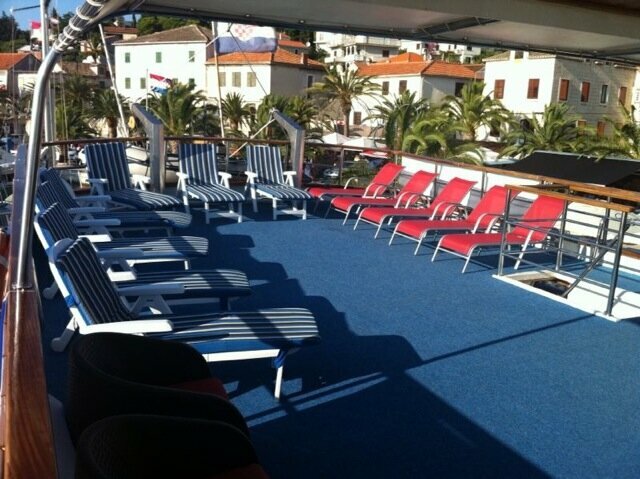 DAY 1: We meet at noon onboard our boat docked in the small town of Trogir, Croatia. If you arrive early, take some time to explore this charming historic town. Named a UNESCO World Heritage Site, Trogir is easily visited on foot. You can discover the 9c church or the 13c fortress, or purchase anything you’ve forgotten in the open-air market. Our home for the week, the Azimut, has 18 cabins each with its own bathroom. 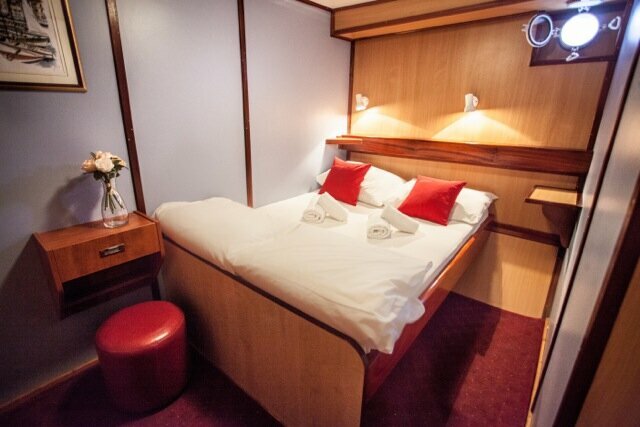 Some of the rooms are above-deck and have a porthole and a door that opens to the outside. 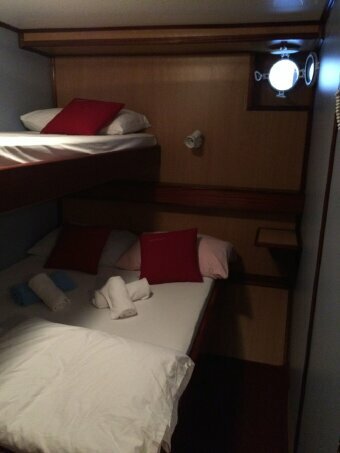 Other rooms are below-deck with a door that opens into a center hallway and a porthole to the outside. These rooms are quieter, darker, and tend to sway less, even though our boat generally experiences minimal rocking. 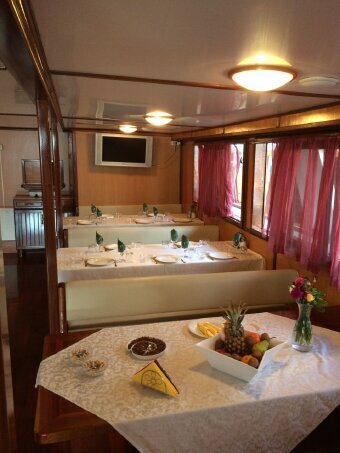 We’ll have a short orientation and introductions and then enjoy our first lunch together as we cruise to the island of Solta. Once on the island, we’ll be fitted to our rental bikes and then begin our first bike ride. We’ll stop along the way at a beekeeper’s house. His passion is infectious and you’ll soon be learning all about queen bees, drones and worker bees and tasting honey, pollen and propolis. 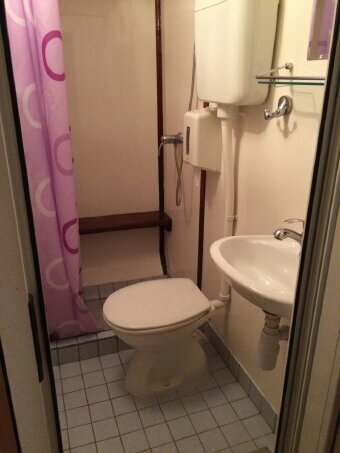 After our ride, we’ll have time to clean up before our first dinner together on our boat. 12 miles. DAY 2: In the morning, we’ll enjoy breakfast on the boat as we head toward our next island. We’ll dock in the town of Stari Grad which means “old town.” It is one of the oldest cities in Croatia, first named by Greek settlers in 384 BC. We’ll cycle through the UNESCO World Heritage Site of the Stari Grad Plain. These plots of land are still farmed with olives and grapes as they were 2400 years ago, and their centuries-old dry stone walls still remain. After lunch on the boat and our first swim of the week, we’ll get back on our bikes to head to the town of Hvar. 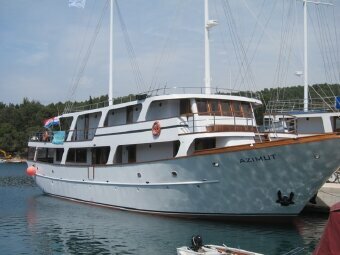 Once an important seaport, today Hvar is a popular stop for the rich and famous. You can’t miss the site of the huge yachts docked nearby. If you have the energy, climb to the top of the largest hill in town to explore the 16th century fortress and enjoy a stunning view of the bustling town below with the glistening blue water beyond. 26 miles. DAY 3: As we enjoy breakfast, we’ll head toward the island of Vis. It is the furthest island from the mainland and its surrounding sea is rich with fish. The island’s inhabitants consider themselves to be the best fishermen in the world. We’ll stop for a private lunch at a traditional Croatian konoba for a special feast of seafood before returning to our boat. 20 miles. DAY 4: Another day, another island. 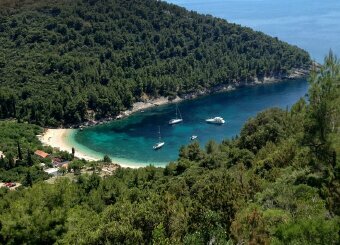 We head to Korcula and to what some say is the most beautiful of all the Croatian islands. We’ll cross the entire island on our bicycles and be treated to gorgeous views of the coast as we ride through lavender fields and cypress trees. Once in the town of Korcula, we’ll have a guided walking tour and learn how the streets were built more than 1000 years ago to maximize the cool breezes coming off the ocean. Dinner is on your own tonight, so you can enjoy a little shopping or dining al fresco. 30 miles. DAY 5: We return to the island of Hvar this morning for a bike ride on the quieter side of the island. We’ll cycle along the island’s backbone with views of the sea on both sides of us. There is little traffic, so you can enjoy the sound of birds singing and the sweet scent of oleander and jasmine. 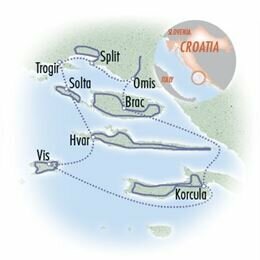 After our ride, we’ll motor to the island of Brac. Along the way, you’ll see one of the island’s limestone quarries and learn where much of the stone that built these beautiful Croatian towns has come from. 20 miles. DAY 6: We head toward the town of Omis at the mouth of the Cetina River on the mainland today. 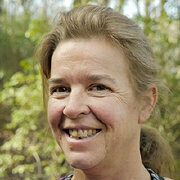 The terrain will look very different from what we’ve seen all week, as there are no freshwater streams on the islands. We will cycle up the deep river gorge through a thick canopy of trees. In the afternoon, you can choose to cycle back down the other side of the gorge or to raft the Class II river rapids. Afterwards, we’ll have lunch at a local restaurant where you can watch the bread being baked in the largest wood-fired oven you’ve ever seen. .
We’ll return to our boat and head to Split, the second largest city in Croatia, in time for a walking tour of Roman Emperor Diocletian’s Palace in the center of town. The UNESCO World Heritage Site was first constructed in the 3rd century and has been transformed over the centuries to accommodate the needs of the time. It is still being used today and is a beautiful and captivating place. 16 or 33 miles. DAY 7: After breakfast, we’ll cycle to the quiet part of Split. We’ll loop through Marjan Park on roads closed to traffic as we climb to an overlook with a gorgeous 360° view of the town and sea. After one last opportunity to swim, we’ll return to Trogir for our last overnight. We’ll celebrate the end of our wonderful week together with a Captain’s Dinner. 10 miles. DAY 8: We’ll say our good-byes after breakfast this morning. You are free to travel to the Split airport on your own for your return home. 0 miles.